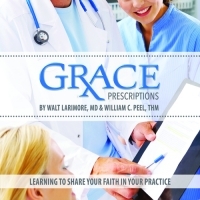 Grace Prescriptions is an eight-week course for those working in the healthcare field (medical and dental professionals, therapists, social workers, and support staff) on how to prescribe specific and appropriate doses of grace that may bring your patients a step closer to a right relationship with God. The course will take place on Sundays from 10:30 am -12:15 pm in the mezzanine conference room at New Life Fellowship Church (82-10 Queens Boulevard) beginning on Sunday April 29 through Sunday June 17. There will be training on how to recognize “faith flags” (signs that a person is open to talking about spiritual issues), the importance of taking a spiritual history, the scientifically studied power of prayer in the health of patients, how to respectfully pray with a patient, how to encourage them to think about their health and life in relationship to God, and how to “prescribe” doses of grace. The course will be co-lead by NLCHC’s Medical Director, Dr. Christi Ganham, and Dr. Kitty Chan. The cost of the workbook is $15. Please register and order a workbook via the following link https://newlifefellowship.ccbchurch.com/goto/forms/576/responses/new Space is limited so reserve your spot early.